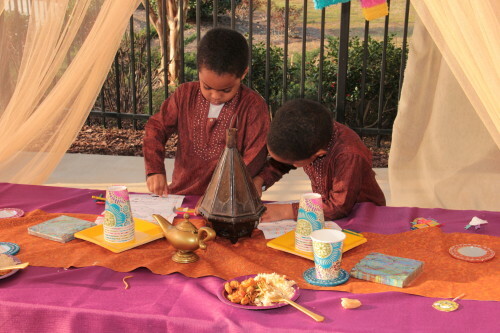 Arabian Night Kids Party Using a Moroccan style. offering a relaxing place to enjoy it. In This Arabian Night Kids Party We used a vibrant colors and patterns, including light weight,and heavy fabrics with rich colors and textures.We included Moroccan style accessories such a hand painted glass vases rimmed with a gold patter,authentic hand made Moroccan Lanterns and a lot of colorful pillows. Our company provides excellent customer service, and we work hard to assemble customized ideas for each event that we plan. Our support staff is very friendly, and we can quickly answer any concerns that you might have about planning your child’s party. Trendy Fun Party handles events intended for both children and teens. We’re the Atlanta, GA, kids’ birthday parties planner that area families trust when they expect everything to go off without a hitch. Make arrangements to discuss your ideas with one of our knowledgeable and hardworking planners, and we’ll help you come up with an idea that will leave your children and their friends feeling amazed. Trendy Fun Party are the Atlanta GA. kids’ birthday parties planner that area families trust when they expect everything to go off without a hitch. Make arrangements to discuss your ideas with one of our knowledgeable and hardworking planners, and we’ll help you come up with an idea of Arabian Night Kids Party in Atlanta GA that will leave your children and their friends feeling amazed.